The strange cosmic objects called quasars are some of the perkiest objects in the cosmos. Quasars are essentially galaxies with massive black holes at their cores, sucking in matter and releasing gouts of x-rays that generate a massive, broiling-hot cloud. Like several astronomical pictures that you see, this isn't a precise image of what you'd see with your own eyes if you were moving around this quasar, known as RX J1131. 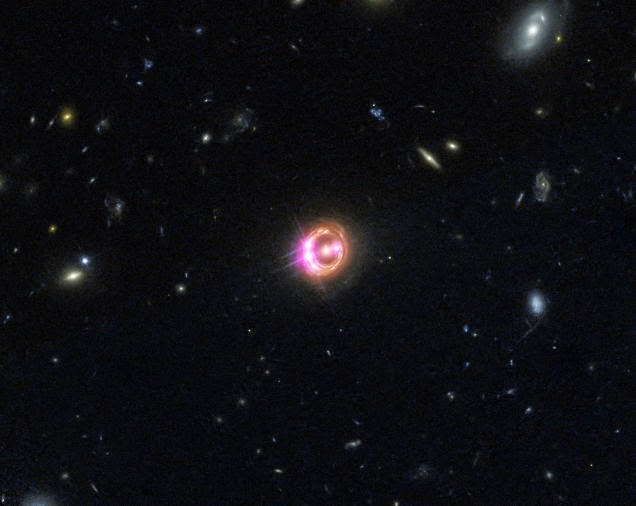 The image you're seeing is relatively created by gravitational lensing from a neighboring galaxy, generating four images of the quasar (in pink). Even with the distortions, you can comprehend how bright it is. “Multiple images of a distant quasar are visible in this combined view from NASA's Chandra X-ray Observatory and the Hubble Space Telescope. The Chandra data, along with data from ESA's XMM-Newton, were used to directly measure the spin of the supermassive black hole powering this quasar. This is the most distant black hole where such a measurement has been made, as reported in our pressrelease. Gravitational lensing by an intervening elliptical galaxy has created four different images of the quasar, shown by the Chandra data in pink. Such lensing, first predicted by Einstein, offers a rare opportunity to study regions close to the black hole in distant quasars, by acting as a natural telescope and magnifying the light from these sources. The Hubble data in red, green and blue shows the elliptical galaxy in the middle of the image, along with other galaxies in the field. The quasar is known as RX J1131-1231 (RX J1131 for short), located about 6 billion light years from Earth. Using the gravitational lens, a high quality X-ray spectrum - that is, the amount of X-rays seen at different energies - of RX J1131 was obtained. The X-rays are produced when a swirling accretion disk of gas and dust that surrounds the black hole creates a multimillion-degree cloud, or corona near the black hole. X-rays from this corona reflect off the inner edge of the accretion disk. The reflected X-ray spectrum is altered by the strong gravitational forces near the black hole. The larger the change in the spectrum, the closer the inner edge of the disk must be to the black hole.